A problem with developing the world’s tallest building is that “green” architectural features may not mesh too well with with being iconically tall and skinny. It is a bit like expecting a supermodel to eat a balanced diet. Nevertheless, the folk at Emaar Properties in Dubai are doing their best to improve the Burj Khalifa’s energy diet. Today, they announced that the building’s hot-water system had gone solar. “Energy efficient measures, especially through use of renewable sources, are not an option but an imperative for sustainable growth,” said Ahmad al Matrooshi, the managing director of Emaar. Saying the solar project underscored the developer’s commitment to the Dubai’s government’s sustainable development goals, he added that Burj Khalifa was “setting an example”. 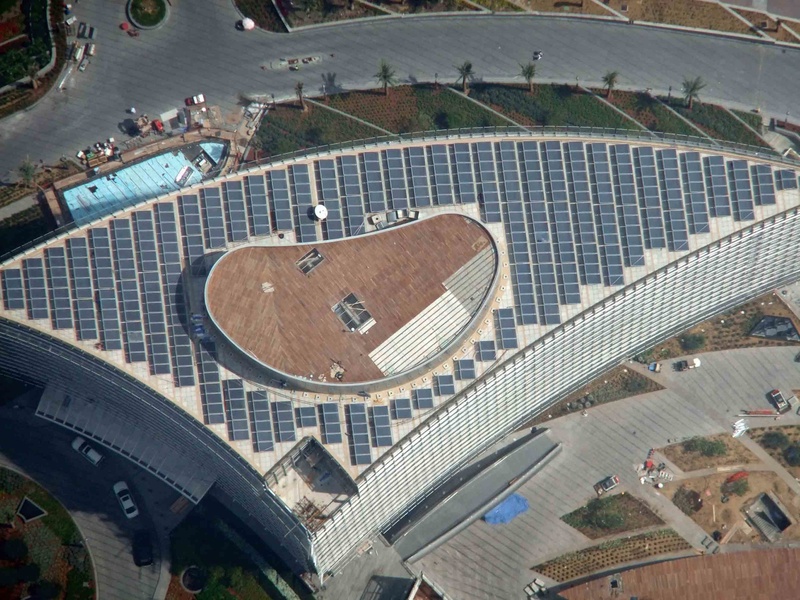 Dubai’s newest photovoltaic solar array is on the rooftop of The Offices, an annex with more roof space than the skinny Burj. It is a little unclear from the press release, but the 378 solar panels may be capable of combined peak electricity generation of 3.2 megawatts. 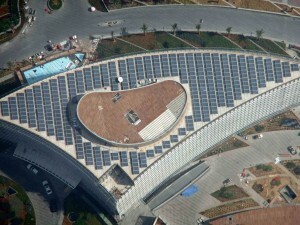 Over the course of a year, during which the actual power output will vary according to the time of day, season and weather conditions, they may produce as much as 690 megawatt hours of electricity, which Burj Khalifa will tap in place of power that would otherwise have to be purchased from the Dubai Electricity and Water Authority (DEWA). At the moment, DEWA’s power and water plants run exclusively on fossil fuels, oil and gas. Emaar intends to use the Burj’s solar power to heat 140,000 litres per day of water for distribution to homes and businesses within the tower. The developer says that can be done with about 7 hours of daily sun exposure. In an additional energy and water efficiency measure, Emaar is collecting condensate (moisture from the air) from the Burj’s air-conditioning equipment to cool the building’s drinking water supply. Used coolant is then stored in an on-site tank to be tapped for irrigating the grounds. “Within the confines of Burj Khalifa’s architectural design – that of a tall building with a fully glazed facade and little solar shadng – a concerted effort has been made in the design and construction to make it environment-friendly,” Emaar said.